Imagine a cubic foot of air near the ground level at the race track. It may seem empty but there are molecules moving around within that area. Depending on various environmental factors, that cubic foot of air can contain oxygen, other elements such as nitrogen and carbon dioxide, moisture, and particles of pollution. Each of these vary depending on the location, elevation, and current weather environment. We need oxygen for combustion in our engines. However, as we can see, the amount of oxygen in the atmosphere fluctuates. This is why, for instance, you might notice a great engine performance at certain times of day and bad performance at others. Tracking the weather can help us determine jetting changes in order to compensate for the changing atmosphere. Using the information we provide on the tracks pages of this site can help you do that. This article will explain those variables. Hopefully it will help you to better understand the atmosphere and better tune your engine for optimum performance. temperature: This seems simple: how hot or cold the atmosphere is. However it is really a measure of how much energy of motion is going on amongst molecules in the atmosphere. The higher the temperature, the greater the amount of energy; the lower the temperature, the less the amount of energy. This tends to mean that higher temps have lower air density because the particles of air are moving around a great deal. This also means that with the greater amount of motion, there is more available space for other molecules, such as water vapor. relative humidity: This is a percentage from 0% moisture in the air to 100% moisture given the amount of other molecules in the atmosphere. That means that the value of 100% is not a fixed amount. It varies based on other atmospheric elements. Remember above how temperature measures how fast molecules are moving and how with hotter temperatures, which move faster, tend to be fewer? That means that the hotter the temperature, the more room there is for moisture and other molecules. So, relative humidity is not only a function of how much moisture is present but also the current temperature. If the temperature changes but the amount of moisture in the air stays the same, the relative humidity percentage will change. *note: We obtain this value from a third party weather feed. uncorrected and corrected barometer: Barometer measures the pressure exerted by the weight of the air in the atmosphere. Again we head back to temperature and how much the molecules are moving around in the atmosphere. 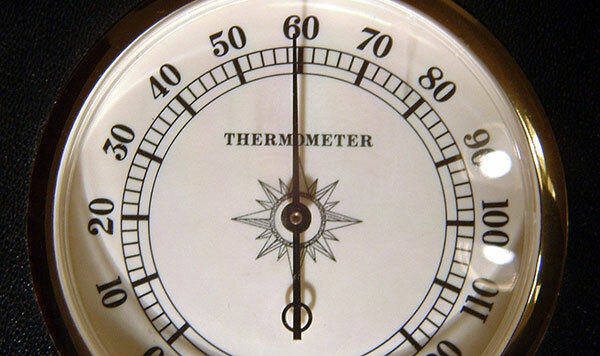 The hotter the temperature, the lower the barometer tends to be. You might have heard of a high pressure system and a low pressure system from the local weather man. A high pressure system tends to have a higher barometric pressure and lower temperatures. This makes sense because a high pressure system would have a greater amount of air in the atmosphere which would increase the amount of pressure. A low pressure system has a lower barometric pressure and a higher temperature. This also makes sense because lower pressure system would have fewer air molecules which would decrease the pressure. The the weight of air gets less and less the higher the elevation. Because of this, barometer values get smaller at higher elevations. Meteorologists have created a corrected barometer that adjusts the value to a standard across different elevations. When a layman is determining if bad weather is coming, this corrected value can help them to compare. However, when determining the actual amount of oxygen in the air (and not a corrected amount) you should always use the uncorrected value. *note: We obtain the corrected value from a weather feed. We calculate the uncorrected value using this and the elevation. wind speed and direction: Wind speed is fairly self-explanatory... it's the speed of the wind. Wind direction, however, can be a little tricky. The given direction is where the wind is blowing from and NOT where the wind is blowing to. This means that if the direction given is S (south), then the wind is blowing from the south towards the north. If NW is given, that means the wind is blowing from the northwest towards the southeast. The number in parenthesis next to the wind direction is the degree from due north the wind is coming from. This is from 0 to 360 with 0-90 being northwest, 91-180 being southwest, 181-270 being southeast, and 271-260 being northeast. Again, this is the direction the wind is blowing from. dew point: Given the current amount of moisture in the air, this is the temperature the atmosphere would need to reach in order to saturate the air. Remember that relative humidity is 100% when it reaches the amount of moisture that can be held in the current atmosphere? That is not 100% of the atmosphere but 100% of the available space in the atmosphere given the amount of other molecules in the air. If the current percentage of humidity were to stay the same but the temperature were to lower (meaning there would be more air molecules present), the humidity would reach full saturation in the atmosphere and dew, rain, or fog would be the result. This is often seen as a better gauge for how much moisture is in the air over relative humidity. *note: We calculate this value using the temp, hum, and bar values obtained from a third party weather feed. saturation pressure: This is the pressure version of dew point. If the vapor pressure reaches this level, then relative humidity will reach 100% and dew, rain, or fog will result. The saturation pressure varies depending on the temperature because the temperature influences how much air is in the atmosphere and, therefore, how much space there is for water vapor. vapor pressure: The pressure of the water vapor in the air. The vapor pressure is part of the uncorrected barometer value. If you subtract vapor pressure from the uncorrected barometer, what is left will be the amount of pressure from just the air. If this amount reaches the saturation pressure then water vapor will condense into a liquid and rain, dew, or fog will result. grains of water: This is an absolute measurement of how much water vapor is in the air. There are 7000 grains in a pound of water. There are 13.1 cubic feet of dry air in a pound of dry air. The measurement of grains of water is the amount of grains in a pound of air. While relative humidity and dew point are influenced by the temperature, grains of water is an absolute measurement of just the amount of water vapor in the air. air density: On our site this is expressed as a percentage of the total mass of a cubic foot of air. It is defined as the mass of air per unit of volume it occupies or how much air (oxygen, nitrogen, carbon dioxide) is in 1 cubic foot of atmosphere. The density of air decreases as the temperature or humidity rises and increases as temperature or humidity decreases. This can be confusing because the air can feel thick and soupy on hot humid days however the density of actual air is lower because the same volume of space is being taken up by humidity. On our site we give the air density with and without water vapor. The percentage with water vapor is the total density of the air including grains of water. The percentage w/o water vapor is the percentage of just the air and not including water vapor at all. Generally you will want to use the value with water vapor. Both values are provided to use as a comparison for how much moisture is in the air. density altitude: This is a value in feet above sea level that the current conditions are similar to. The air density becomes less as elevations above sea level increase. Temperature and barometer changes influence the air density in a way that is compared to these elevations. Essentially, this is air density but measured as a distance from sea level. Using this information, we hope you are better able to jet your engine. Initially it can be difficult to wrap your head around but understanding these values can help when trying to maintain an air/fuel ratio in your engine setup. If you would like more information on how to use these values to tune your engine, you can check out books from RaceCarBook.com.